A sunny citrine ring from Apples of Gold art deco collection is all you need to brighten a day--and your jewelry collection. The sun-drenched gemstone measures 6mm, just the perfect size for chasing away cloudy skies. The citrine stone makes a bold appearance when set in this bright yellow gold and mounted above the band in an elaborate setting. A white gold band maintains the brightness of this ring, and is adorned with art deco designs to continue the bold look. 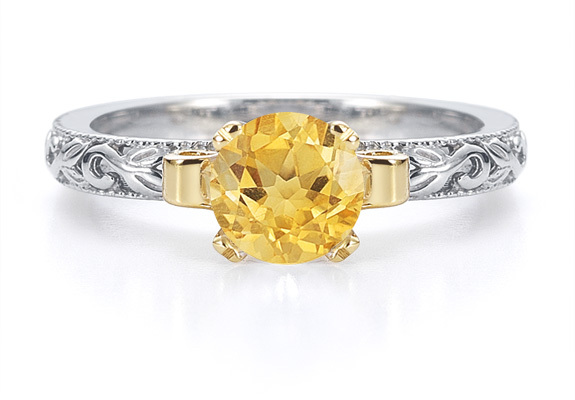 We guarantee our 1 Carat Art Deco Citrine Engagement Ring to be high quality, authentic jewelry, as described above.